Grand Rapids in Michigan has been named the best beer town in America, according to a recent poll by USA Today readers. For those who aren’t from the US, like me – or aren’t terribly good at geography, also like me – Grand Rapids is the second-largest city in Michigan. It’s located on the Grand River, roughly 25 miles east of Lake Michigan (one of North America’s five Great Lakes). Grand Rapids has more than a dozen beer breweries, including Founders Brewing Company, Grand Rapids Brewing Co., Brewery Vivant and BOB’s Brewery. 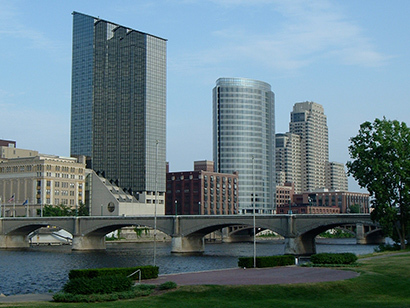 Grand Rapids tied with Asheville in North Carolina for the title of best beer city in 2012. However, it won the title of best beer city outright in 2013 and, now, in 2014. It must be a very impressive mecca for beer lovers. In second place on USA Today’s list of the top 10 beer towns in the USA was Tampa, Florida, which is home to more 30 beer breweries and brew pubs – including Cigar City Brewing, Wild Rover, St Pete Brewing Company, Rapp Brewing and 3 Daughters Brewing, to name just a few. Third on the list of best American beer towns was Asheville in North Carolina. Only the eleventh largest city in the Southeast American state, Asheville nevertheless boasts a proud beer-drinking pedigree, having been the reigning “Beer City USA” from 2009 to 2012.
Notable Asheville breweries include Wicked Weed, Highland Brewing, Green Man, and Burial Beer Company. Meanwhile, even craft beer superstars New Belgium and Sierra Nevada are reportedly looking to set up bases of operation there. By US state, Oregon and Colorado had the greatest number of in the top 10 best beer towns, with two each. So, what do you think? Leave a comment below. Having never yet made it to any of these US towns/cities, I have no opinion – except that I want to visit them now!